Also removes other VOCs labeled by EPA as "Most Dangerous"
Click on performance chart next to product picture. 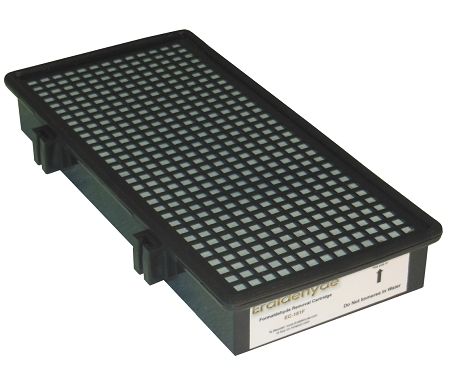 A replacement cartridge that removes formaldehyde or ammonia for use in the Eraldehyde-80 and Eraldehyde-180 models. (Performance graph icon is next to product picture.) 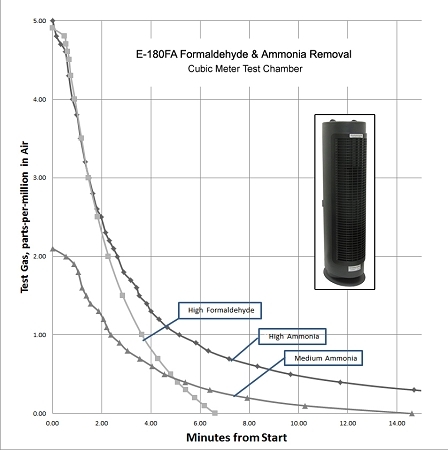 Works quickly and exchanges room air (in the E-180 model) over 3 times per hour in a midsize (180 sq ft) room and once per hour in a large (540 sq ft) room, so it only needs to be run whenever you can smell chemical vapors. Works well on formaldehyde in small to larger rooms and will remove several other VOCs as well (including benzene and phenol). This is a consumable item; No trial period. Warranty and returns limited to one year replacement for manufacturing defects.